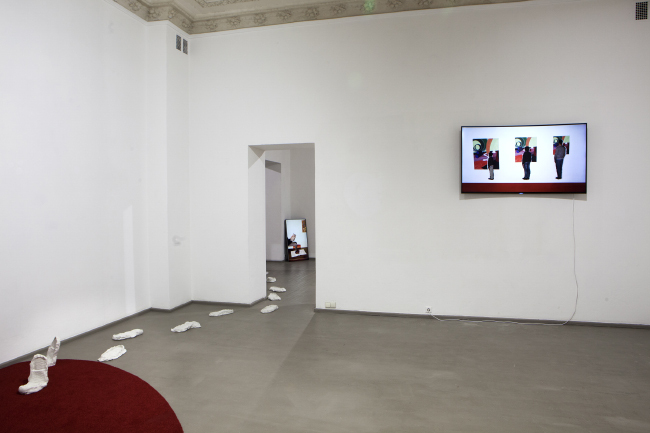 One must concur with the Vilnius gallery Vartai in their declaration that Indriķis Ģelzis has announced his presence on the stage of contemporary art both swiftly and powerfully. He has already acquired a certain recognition on the Latvian art scene, and his last exhibition, “Sveika, Galva” (Hello, Head), is still fresh in our minds with his bluish-pink, full-size automobile sliced into two halves – along with other works in various visual art mediums. With this aforementioned piece, he wished to talk about the subjective world perception and the coexistence of parallel worlds of perception – one of the dominant issues covered in his works. Ģelzis' solo show “We Have a Think In Common”, at the Vilnius art gallery Vartai, is the start of his road to recognition in Lithuania. At first the gallery was planning on giving over just one room to Ģelzis, but once they acquainted themselves with his works, they were so dazzled that they devoted a whole three rooms to the show – two of which will contain a piece made specially for this exhibition. 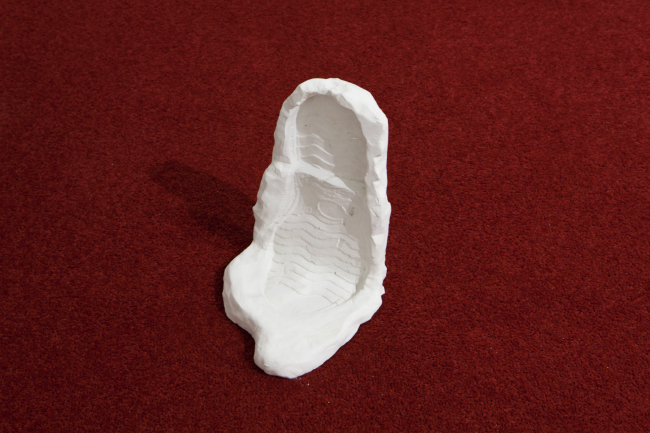 The piece in question consists of both video and installations that speak about the subjectivity of the perception of art, of how differently one work of art can be interpreted, and that nothing is uniform or homogeneous. In one of his interviews, Ģelzis has said that what makes an artist happy is to be able to work constantly, and it seems that he adheres to this principle daily – he has already two exhibitions slated for this year, and has also secured a position at a European residency program. Arterritory.com met with Ģelzis before he headed to Vilnius, where his exhibition will on view at the Vartai gallery through February 7. One of the leitmotifs in your works is parallel worlds of perception, and how it is possible to perceive one object in many different ways. How do you interpret the piece you created for the Vartai gallery? The piece is about the relationships between an artwork and its observer, much as I have done in my previous exhibitions. Now I'm continuing onward with this theme, looking for the differences that develop when several people look at one artwork; I'm studying what sort of interpretations or new observations form as a result. 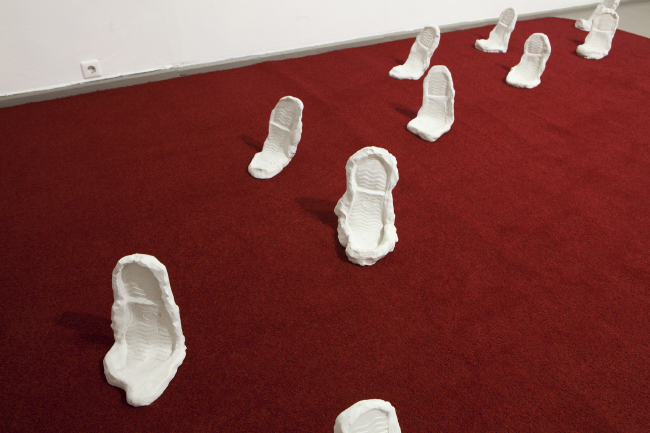 My first impulse for this show was an idea about walking across a carpet, which I've depicted with poured casts of footfalls. They ignore the video going on in the room by sidestepping it. Absolute silence rules here, and upon this backdrop, the viewers can sink into a cacophony of discussion about the artworks on view. The video work depicts the meaning that appears on a certain scale. The smaller a person is, the larger the artwork appears to him; the larger the person is, the smaller the artwork becomes. Thereby a perspective is formed – at one end the significance of the artwork disappears, whilst at the other it consumes absolutely everything. I wanted to show this depiction in a sort of cross-cut. 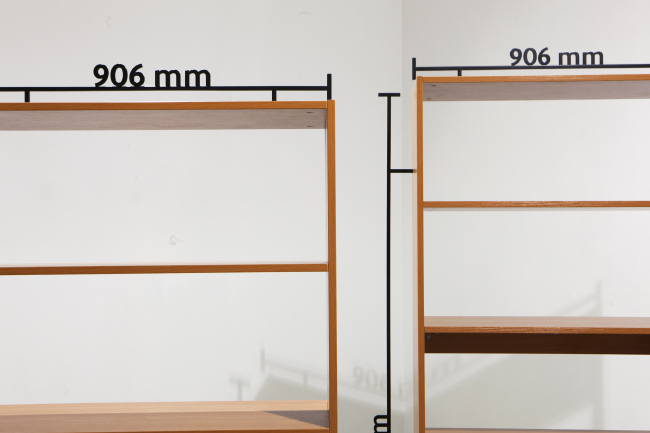 The same goes for the two identical shelves in two different sizes, but with the same dimensions. 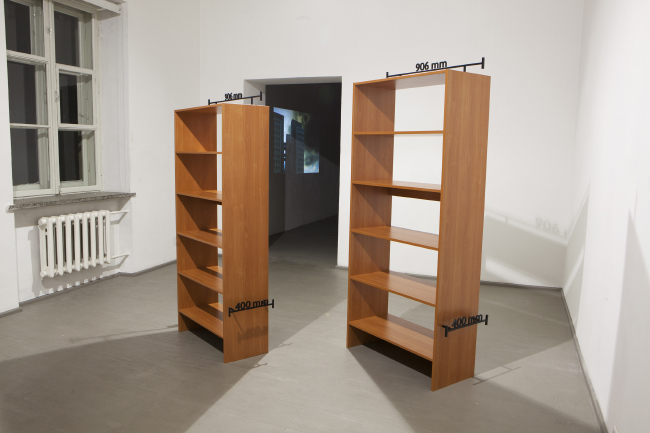 This work depicts how two different people observe the same shelf. Obviously, one is larger than the other. There are several scales – possibilities – in which one and the same thing can be placed on the shelf; it depends on who is placing it there. What is it about this theme that gives you impetus? In my opinion, it is impossible to retell or communicate in some other way that which you have seen. The way that you, exactly you, perceive your surroundings. I don't want to believe that a thing can have only one absolute connotation. What role do you think that artists have in interpreting their own works? I've already given up! The idea that I want to express is very important to me personally, however, the way in which each person perceives my artwork is up to him or her. At least in this exhibition that's for sure! I've thought about this a lot. On the one hand, it's important that the artwork sends out the message that I have intended; maybe it can explain the whole thing. On the other hand, that seems boring. If everything about the artwork is clear cut, then it seems that the magic of the artwork has disappeared. It's good if there's some space left for imagination, space for the viewer's own interpretation. Is the reaction of the viewer important to you? When I'm creating my works, I don't think about that, of course. But I have always been interested in the reaction of the viewer once the work has been put on view, and I tend to observe them. If I had wanted to shock the viewer, then I would have to work on that aspect from the very start. I always like to ascertain how the viewer perceives the work and what he sees in it. The more varied the perceptions, the better! Usually viewers don't surprise me with new interpretations, however. What does surprise me is when a viewer comes over and says that he likes it (laughs). This will be your first solo show in Lithuania. What is your take on the Lithuanian art scene? Are there any artists in our neighboring country that especially interest you? The Lithuanian art processes are operating at a rather high level, in my opinion. I'm happy about this show, and the gallery space is great, too; I can't wait to start setting up my works. I hope this experience will result in my meeting artists and curators from Lithuania, and the forging of new contacts. 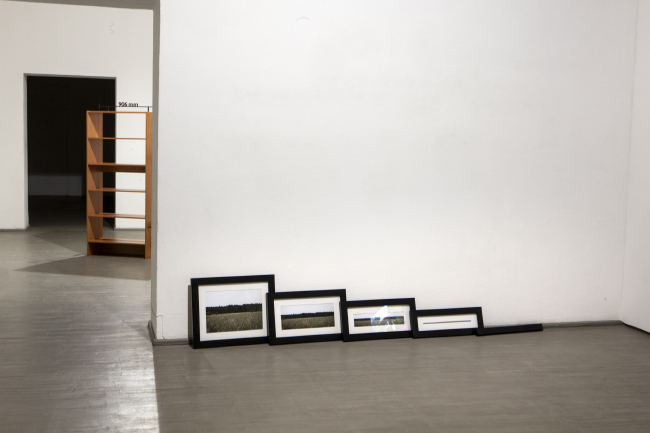 The artist Ugniuss Gelguda has come to my attention, and his exhibition “The Metaphysics of the Runner”, at CAC this summer, has stayed in my mind. In October of last year, at the gallery “427” headed by Kaspars Groševs and Ieva Kraule, there was an exhibition of works that I was very fond of, by the Lithuanian artist Marija Olšauskaite. Of course, I must mention the Lithuanian curator Raimunds Malašausks, who is a respected and notable curator in Western Europe as well; he's curated an exhibition at London's Lisson gallery, which I believe is a great accomplishment.